This weekend T-birds from near and far are flying home to say one final goodbye to their beloved campus. In a few short months Thunderbird will no longer call Glendale home, but will instead be nested within the ever-growing streets of downtown Phoenix. While the move offers much potential for Thunderbird’s growth, it is an emotional time for many who have fond memories on the Glendale grounds. This weekend’s Campus Tribute event provides many opportunities for a “last hurrah” at the home T-birds have known and loved for over 70 years. Please note that some of the events require registration and may include a registration fee. These events are marked in bold. You can register here. For the official schedule, locations and times of events, please visit https://thunderbird.asu.edu/campus-tribute, or view a PDF of the agenda. The Campus Tribute event technically kicks of on Friday, but for T-birds that will already be in town, Thursday night has a few festivities. 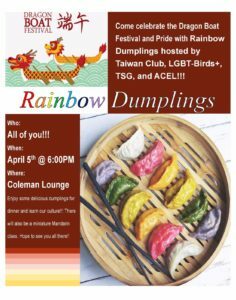 The Taiwan Club, LBGT-Birds+, TSG and ACEL are collaborating to host a rainbow dumplings event from 6-8 p.m. to celebrate the Dragon Boat Festival and Pride. Attendees will enjoy dumplings for dinner and can partake in a mini Mandarin class. See the Facebook event for more details. Thursday nights are traditionally Pub nights, so it’s a safe bet that current students will flock to the Pub to ring in the weekend. 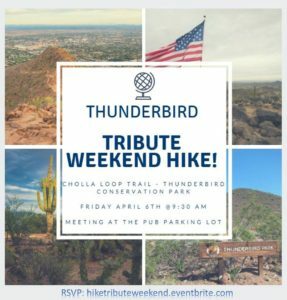 The Thunderbird Hiking club is hosting a hike at Cholla Loop Trail starting at 9:30 a.m. Register here. On Friday afternoon the Honor Council is hosting an Ethics Roundtable from 2-3 p.m. featuring Dr. Mary Teagarden, Professor of Global Strategy. The event will cover the mystery behind Chiquita in Colombia and how a company should react when faced with doing what is right or ethical. Please check the Facebook event page for updates and more information. 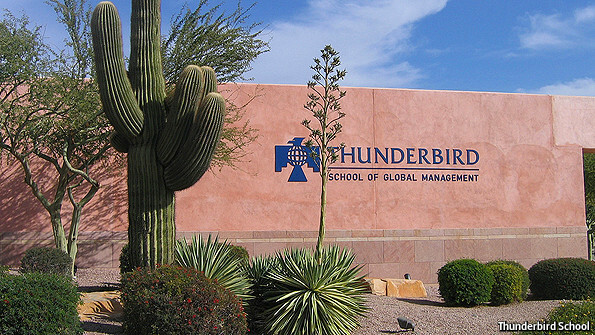 Afterwards, students and alumni can partake in a speed networking event at the Thunderbird Event Center from 3-5 p.m. The Archives, IBIC, Founder’s Hall and ThunderShop will be open from 3 p.m. onwards for attendees to explore Thunderbird’s history and snag some Thunderbird swag. Finally, the day’s excitement will come to a close with a Pub night at both the old and new Pubs from 6 p.m. till midnight. Various Thunderbird clubs are putting on a showcase from 10 a.m. to 3 p.m., for alumni to learn more about the current student-led happenings at Thunderbird. Thunderbird alumni and staff departments will also showcase their products, services and achievements. Be sure to stop by the Das Tor booth to purchase a new copy of Thunderbird Through the Years, a compilation of Das Tor articles dating back to Das Tor’s origins. During the showcase, keepsakes will be collected for a Time Capsule. The Archives, IBIC, Founder’s Hall and Thundershop will also be open during these hours. From 10 a.m. to 3 p.m., a meeting in Yount Building Conference Room will discuss the Arizona Center, Thunderbird’s temporary home in downtown Phoenix, as well as plans for the permanent building. Dr. Morrison will welcome alumni and their guests back to campus at 11 a.m. on the Tower Lawn, with margaritas to follow. Class and group photos will be taken in front of the Tower starting at 1 p.m. Next, Dr. Gary Gibbons, Ph.D., and Clinical Associate Professor, is leading a one-hour Master Class at 2:15 on concepts of value for non-public firms. The discussion will cover what methodologies are commonly employed to value non-public firms, what problems are usually encountered and best practices when considering non-public firm value. An “All Around the World” themed Regional Night will follow from 6 p.m. to 9 p.m. Food, student and alumni performances, and activities are scheduled to represent regions across the globe for the final regional night at the Glendale campus. As the weekend winds down, breakfast will be served at the Tower Lawn from 9 a.m. to 11 a.m. The ThunderShop will also be open one final time from 9 a.m. to noon. Afterwards, Alumni are invited to check out Thunderbird’s new home. Transportation will be provided to the Downtown Phoenix Campus at 10 a.m., for a visit to and presentation on the future of Thunderbird. Tours of the campus will be conducted from 11:15 a.m. to 1:30 p.m. Transportation is provided back to Thunderbird at 1:30 p.m. Already started and closing on April 7 at 10 p.m., a silent auction of historic Thunderbird items is open. Check here for information. Items can be picked up on Sunday, from 8:30 a.m. to 11 a.m., or can be shipped. Registration will also be held each day (check the schedule for specific hours). Your name badge, t-shirt, agenda and a map of campus will be handed out at this time. You can also change any reservations during registration if needed. With over 1,100 attendees currently registered, the weekend is set to be a great celebration of the many memories on campus. Any questions about the events can be directed to the Thunderbird Alumni Relations office. Are there still copies of “”Thunderbird through the years” Das Tor Articles? How can I get one? You can email me at mary.g.richardson@tbird.asu.edu if you have any other questions. Thanks again!